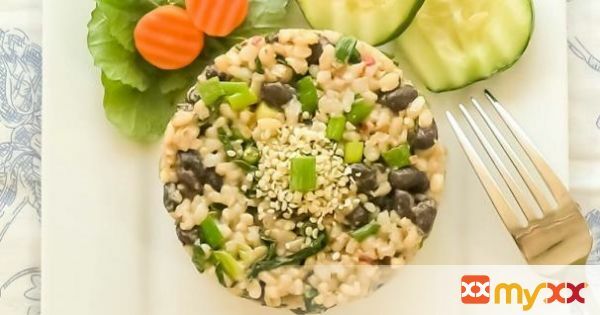 A quick, vegan, high fiber and glutenfree lunch option to add variety to your healthy diet. 1. Heat oil in a pan, add garlic and sesame seeds, as soon as they start getting brown slow down the flame and add white portion of the green onions/spring onions/scallions. 2. Sauté for few minutes in the low flame and add kale and sauté again. 3. Then add black beans. Mix well. 4. Mix in all the spices and sauté again for few minutes. 5. Toss in green portion of the green onions/spring onions/scallions and sauté again. 6. Add brown rice and mix well so that the rice is fully coated. 7. Cover and cook for 3 minutes or until done. 8. Take it out in a serving plate and garnish with hemp seeds. 9. Serve hot, or at room temperature or can be served cold. Can be prepared a day ahead and refrigerated and consumed the next day.